Picture 1: Megahouse Miniatures #5 from the "Memories of Depa-Oku" series released in 2003. Tokyo is infamous for its cramped spaces. So much so that amusement parks or game arcades are confined to any inch of space or ....... department store rooftops. These few months urban Tokyo has embraced the 'Go Eco' motto and rooftops have turned green but during the Showa period or the seventies, when kids could still be seen in abundance, the words "let's go to the departo rooftop" ("department" would be "departo/ デパト" in katakana) would scream fun for any 5 year old kid. 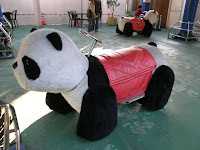 The panda ride is synonymous with the departo rooftop. 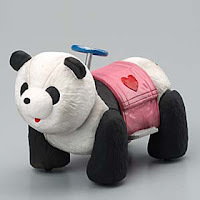 Ask any person who grew up in Japan their fondest memory was riding the panda that just went in one direction, straight. The wheel attached to its neck did no aversion to its direction! Newer ones do turn now. 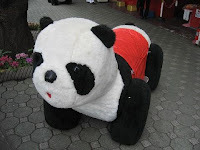 The panda ride is still a top attraction today. 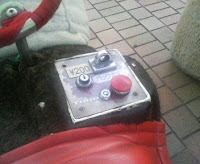 You can see it or ride it in Hanayashiki / 花やしき, in downtown Tokyo. Beware, one ride is never enough!